With our FLH transmission gasket surface cleaned and our new oil pan hardware prepped with blue Loctite, we are ready to start replacing an oil pan with Baker’s 1.5 oil pan assembly. As we’ve noted before; it is not at all necessary to remove the rear wheel, or primary drive assembly when replacing an oil pan. These were only removed in order to have a clear visual for our demonstration. The primary drive assembly will be untouched and the rear wheel moved to the back of the rear fender well. Begin by positioning the supplied gasket over the top oil pan section and move the top section over the cross member, beneath the transmission. 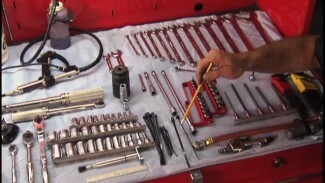 This top pan assembly is the section that will first receive the flow of engine oil. The oil will move from the front to the rear of this section moving through a precisely machined labyrinth. 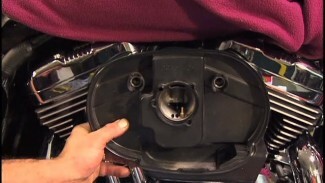 Baker’s two piece construction is necessary because the bottom section is much wider than the gasket profile of the Harley Davidson transmission case. Locate, at least, two screws through the oil pan section and gasket before lifting into position to replace oil pan. The screws will hold the gasket in place and act as a guide as you are handling the pan section. Baker actually recommends using the longer, bottom pan, supplied hardware to aid in holding the gasket in position. The longer, bottom pan screws are easier to handle for this temporary, alignment step. It is important that you confirm correct alignment of the gasket before lifting into its final position. For this, it is preferable to have a second set of hands (and eyes) on one side of the motorcycle. Work together to raise the top section into position and begin loosely installing the nine 3/4″ long screws. After all of the hardware has been started you can begin to evenly and alternately snug the screws. Then, final torque the hardware 110 to 130 inch pounds according to the specified sequence in the Baker instruction sheet. Correctly position the bottom pan and supplied gasket. After the bottom pan is in position and seated with the gasket aligned install the bottom pan bolts referring to Baker’s torque sequence. Snug and torque the screws to 110-130 in-lbs. Follow your Factory Service Manual when reinstalling your rear wheel, belt, belt guard, exhaust hanger, mufflers, and rear brake assembly. Fill the transmission fluid per your service manual’s required capacity when you and fill the BAKER 1.5 with motor oil of your choice. Both, Baker and Bob recommend Spectro® Synthetic V-Twin 20W50 motor oil when you are replacing an oil pan and Spectro® Synthetic 75W140 transmission fluid. * See Baker’s recommendation on fluid amounts per their instructions.